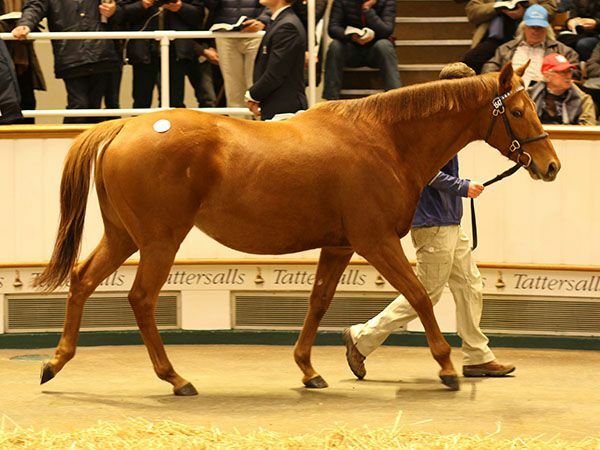 The opening day of the Tattersalls December Mare Sale got off to a buoyant start with a clearance rate of 84% and THE MINIVER ROSE topping proceedings at 550,000 guineas. A total of 205 lots were sold for 11,521,000 guineas at an average of 56,200 guineas and a median of 40,000 guineas, figures that are on a par with the opening session of last year’s sale. 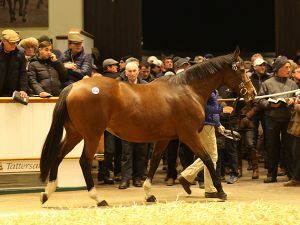 One of the most in demand stallions in the world at the moment is Sheikh Mohammed Obaid’s DUBAWI who stands at Dalham Hall Stud in Newmarket and so there was always going to be plenty of interest in the Group winning mare THE MINIVER ROSE who was offered as part of the Godolphin consignment. A winner of the Group 2 Park Hill Stakes as a three-year-old, the daughter of HIGH CHAPARRAL is a half-sister to Group 2 Blandford Stakes winner BELLE DE CRECY. 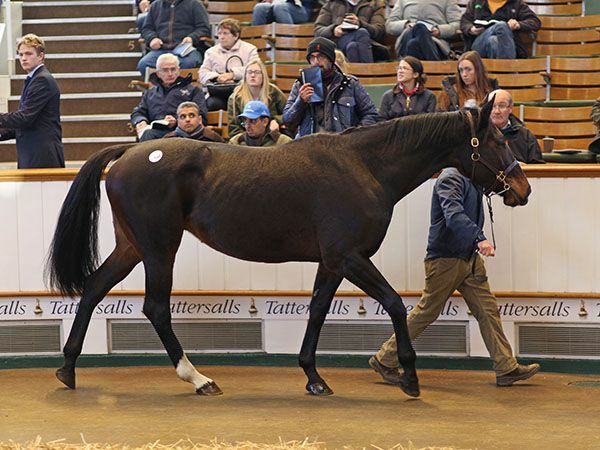 The daughter of the CAPE CROSS mare BLOEMFONTAIN was knocked down to Blandford Bloodstock’s Richard Brown for 550,000 guineas after he saw off David Redvers, standing alongside Sheikh Fahad. "She is a great moving, quality mare and a very good racemare," said Brown, "but what was massively appealing was her cover to Dubawi. In my opinion, he is one of the top two stallions in the world. "My client has tried to get into Dubawi before with limited success, it is a rare opportunity." The Tattersalls December Sale always attracts a diverse range of buyers from all over the world and one nationality present in large numbers are the Australians. They include the Arrowfield Stud team of Paul Messara and Jon Freyer who secured PHYLLIS MAUD for 360,000 guineas. The daughter of HALLING and the ANABAA mare DEBONNAIRE is a half-sister to HARTNELL, arguably Australia’s second best horse at the moment. The dual Group 1 winner was second to the wonder mare WINX in the Group 1 Cox Plate two starts back before running third in the Group 1 Melbourne Cup. She is also a half-sister to ROZ, the Group 1 Fillies’ Mile runner-up. "It is a little while since we have bought here," reported Messara, "but she is an obvious one for us to buy. "She was a good mare herself, and she'll stay here to foal. We'll probably cover on southern hemisphere time." PHYLLIS MAUD was offered by Godolphin with a SHAMARDAL cover, whilst her FRANKEL foal half-brother sold for 250,000 guineas at the December Foal Sale here last week. The consignment from Godolphin realised 4,408,000 guineas for the 59 lots offered. Another mare in high demand was MARIGOLD HOTEL, the GALILEO four-year-old daughter of the twice Group 1-placed HOTELGENIE DOT COM. The half-sister to the Group 1 Fillies’ Mile and Group 1 Falmouth Stakes winner SIMPLY PERFECT and to the dam of Group 1 St Leger runner-up BONDI BEACH was knocked down to BBA Ireland’s Eamonn Reilly for 330,000 guineas. She was offered by Norelands Stud in-foal to MASTERCRAFTSMAN. "She is for Newtown Anner Stud," reported Reilly. "They are buying some good fillies and mares to send to Fascinating Rock. "She is a lovely mare, a great walking mare - she reminds me of the Galileo fillies I used to buy for Jim Bolger." FASCINATING ROCK was bred and raced by Newtown Anner for whom he won eight races including the Group 1 Qipco Champion Stakes and Group 1 Tattersalls Gold Cup and he retires to Ballylinch Stud. Most breeders are delighted if the first foal of a mare wins a race, so Knockainey Stud’s Miriam & Nelius Hayes must have been pinching themselves when the LOPE DE VEGA son of LET IT BE ME, subsequently named SOUTH SEAS, won the Group 3 Solario Stakes before finishing second in the Group 1 Criterium International. The daughter of MIZZEN MAST out of the ATTICUS mare ELEMENT OF TRUTH is also a sister to the Group 1 Singapore Cup runner-up ZAIDAN and was knocked down to David Redvers for 325,000 guineas after he saw off Stephen Hillen. "But South Seas is as good looking as you will find, athletic and light on his feet. "Peter Moloney has also seen her Lawman filly foal and reported that she is a nice sort. The mare has produced two beautiful foals from two shots - hopefully she is just a freakishly good broodmare. She will be joining the elite broodmare band we are putting together for Sheikh Fahad. "I'd love to send her next spring to Charm Spirit, but it will be up to the Sheikh to decide. Lots of options are open including Invincible Spirit, and of course Lope De Vega, sire of South Seas." 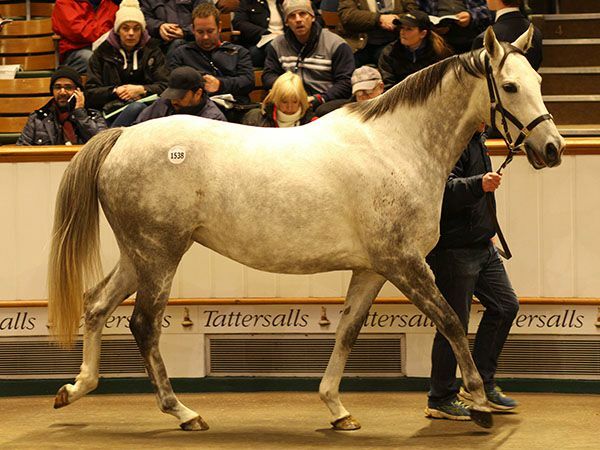 The Tattersalls December Mare Sale continues at 9.30am on Tuesday, November 29th.